When it comes to our customers satisfaction, we only provide what’s best in matter of quality, that’s why we only work with the best ingredients, so that our lovely quadruped friends can be healthy and happy. Why you should order this product? Because you care about your pet’s health and well-being and because it’s made with the healthiest ingredients, vitamins and minerals. You won’t have to trick your dog into eating other food with the pills inside. Our tablets are easy to chew and tasty because of the enhanced bacon flavour. Glucosamine with Chondroitin - helps in supporting and repairing joints, cartilage and improves flexibility. MSM - helps in soothing the inflammation and relieves arthritis pain. Organic Turmeric - is a powerful natural anti-inflammatory and helps relieve the arthritis pain, improves heart health, helps the liver to regenerate and detoxifies it, kills parasites and improves digestion and methabolism. ADD TO CART NOW and be happy with your dog for a longer period. Prevent your dog from suffering and be by his side as he is to yours. YOUR BEST FRIEND: If you are looking to improve your pet's life, you have to try our joint relief supplement that will make your dog healthier and happier. Thanks to the bacon flavour, your pet will love our hip and joint supplements and you can forget the pain of feeding untasty vitamins to him. ULTRA-HEALTHY: Our cats and dogs supplements for hips and joints are made with the healthiest resources like glucosamine, chondroitin, msm, hyaluronic acid, blended turmeric and many other vitamins and minerals. These supplements will strengthen your dog's body for when the old and cold days will come. Take care of your best friend now. 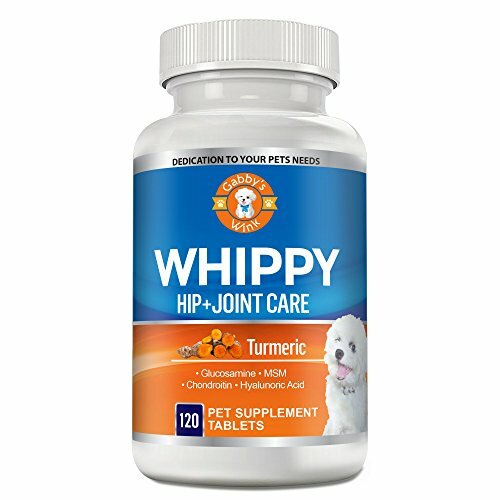 NO MORE PAIN: Made with turmeric which contains curcumin, a chemical known for its anti-inflammatory features and easing hips and and joints pain, your pet not only will benefit a bone and joint revitalization, but his liver, stomach, intestines will feel much better and his digestion will be improved. FOR OLD DOGS: If you have an old dog, you should ease his pain with our joint pain relief supplement. Old dogs tend to have hip dysplasia, arthritis and strong joint pain because of aging. It is more recommended to feed him our delicious dog supplement from an early age to strengthen his body. GENEROUS PACK: Our dog supplement comes in a generous pack of 120 tablets with bacon flavour that your dog will simply love. Please check the instructions on our package and offer the tablets as suggested. If you have any questions about this product by Gabby's Wink, contact us by completing and submitting the form below. If you are looking for a specif part number, please include it with your message.